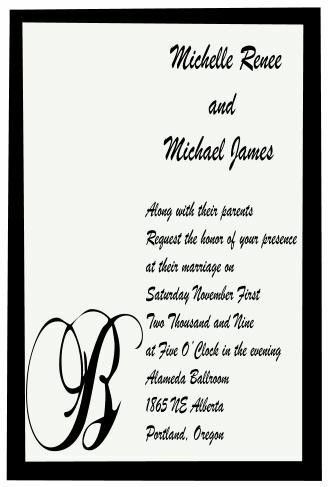 For sale is a wonderful modern, graphic wedding invite- I have used creme and black, with a bold font graphic. The text is printed on a creme cardstock, with a black border, I have then overlayed it with a vellum that the Monogram is printed on. This can be done with a textured vellum as well, or instead of the monogram a different graphic can be used. To attach the vellum a matching ribbon is used- two holes are punched in the top and the ribbon is then tied in a bow after running through the holes. Instead of putting the ribbon at the top we can change that and put it down the side so it opens like a book. The invitation size is 5 1\/2" x 7 1\/4"
This invite comes with the return addressed envelopes in creme with black text as well, also included is matching Response cards w\/ matching envelopes pre-addressed. We can substitute Post card style response cards if desired. Also available with this invitation are matching reception cards, Thankyou notes, wedding programs, or any other needed items ie. table numbers, name cards etc. Other items price available upon request.